PREPARE TO BE TRANSPORTED BACK IN TIME TO ONE OF THE MOST DEFINING DECADES OF 20TH CENTURY BRITAIN! 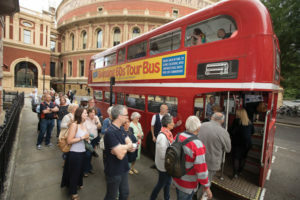 Hear stories of rock stars like The Beatles, The Rolling Stones, Pink Floyd, Jimi Hendrix and other 60s icons Twiggy, Mary Quant, Michael Caine and many others. 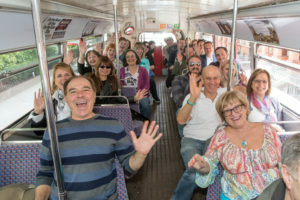 These unique and immersive tours all include original music from the era and live commentary by our friendly and experienced tour guides, giving you an insight into the birth of popular music and the cultural revolution that spawned Swinging 60s London, all from the comfort of our vintage double-decker London bus.Our tours pass by many of London’s legendary 60s venues and locations along their route – some including entry into music related exhibitions, museums and live music events. Four Different Tours to Choose from! The Beatles, The Rolling Stones, The Who, The Kinks, The Cream, Mary Quant, Videl Sasoon, Twiggy, The Kings Road, Royal Albert Hall – all to a 60s soundtrack provided my Radio Caroline!